For the better part of the last seven years, Portland-Seattle was the marquee game in the league. In terms of on field play, atmosphere and fan rivalry, there was no competition which rivalry was king in MLS. After Sunday though, it appears that crown has been passed to Atlanta-Orlando. Don’t get wrong, the Sounders and Timbers fans still create an incredible atmosphere but the on field product just doesn't match the fans' intensity anymore. There’s nothing wrong with low scoring games and nothing wrong with solid defensive games, but not for this kind of event, this matchup, or this rivalry. In Portland’s defense, they did show up… kind of, and at least attempted to entertain the home crowd. 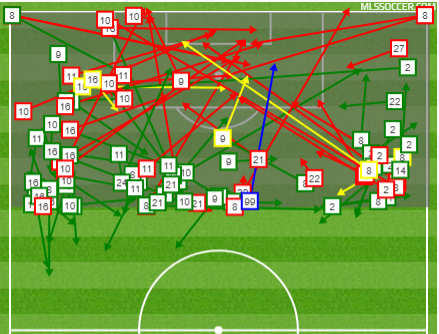 They were just pretty awful at it in the final third as their passing chart to the right shows. And to Seattle’s credit, they did what they had to do given their injuries, but it’s still very disappointing to show up at your most hated rivals stadium and line up with five defenders. It just cheapens the experience for everyone. Before we move on, I do have to say that Clint Dempsey as a lone striker just doesn’t work. You might have been able to get away with it three or four years ago, but now it’s just a sad reminder that Dempsey is well past his prime. 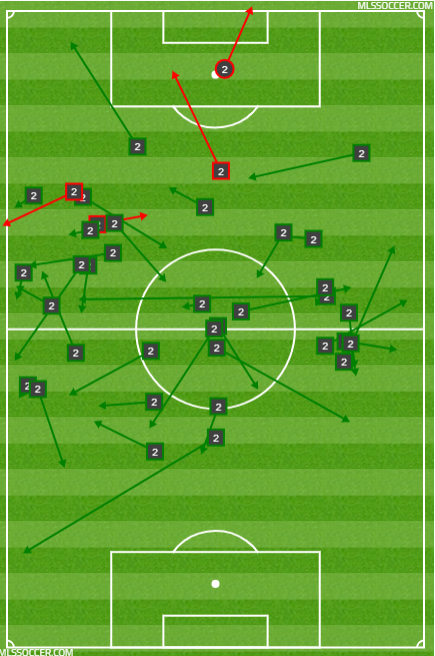 To the left are all of Dempsey's shots (ahem, his only shot) and his passes. It’s a lot of green (which is good), but nothing dangerous. 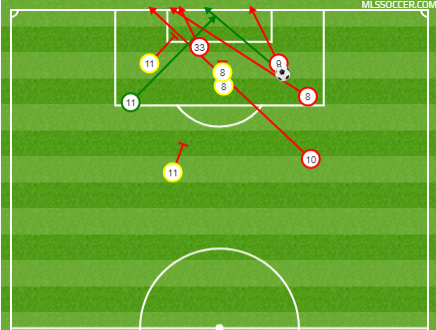 Only three passes came off inside the final third and everything else was just linking and drifting wide because the Sounders couldn’t find a way to get Dempsey the ball and involved in the game. Dempsey operating alone is about as dangerous as a newborn puppy. Atlanta is the New Seattle? And though the Atlanta - Orlando soccer rivalry is still in its infancy, it’s already eclipsed Seattle - Portland in terms of watchability. Orlando, soccer wise, is a bit of a mess and still working their way through what looks like their adolescent years on how to soccer. But when you lack sophistication and maturity, you lean on what you have: youthful exuberance. 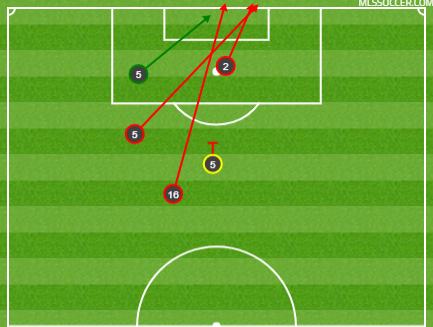 The game itself was actually pretty entertaining, as Orlando themselves, put up twice as many shots on target (six) than both Seattle and Portland combined. And the narrative was certainly a lot more fun too, as Atlanta jumped to a very early 2-0 lead, in Orlando nonetheless before Orlando settled and found a goal early in the second half to set up the stage for an exciting final 40 or so minutes to finish the game. One of the things that Atlanta does so well in their offensive transition is attacking spaces and overloading teams wherever they have the advantage. Above, you can see Greg Garza and Julian Gressel’s passing charts where they operated as wingbacks for Atlanta, marauding up and down their respective flanks to cause confusion for the opposing defenses. What’s aesthetically pleasing to both the eye and to the chalkboard, is the symmetry and balance from both players. Atlanta isn’t reliant on attacking one side or just using one player. They attack space, regardless whether it’s the left, right or even central and keeps defenses on edge to where they might have someone slip in behind. But it’s not just their attack where they have symmetry and balance, defensively they snuffed out Orlando’s attack and kept them at bay. Minus that loose ball that Justin Meram pounced on to give Orlando hope of getting anything out of this one, the Lions' attack was reduced to the likes of a domesticated housecat. 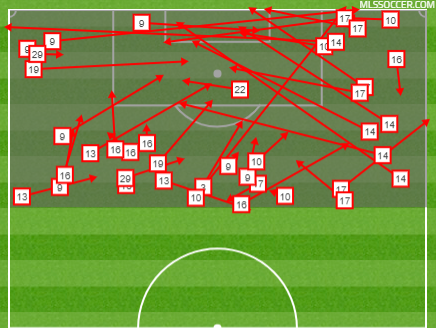 Orlando only had four successful passes inside the penalty area, though two did turn into shot attempts. Orlando was forced to swing the ball outside the penalty area until they grew frustrated and swung in a hopeful cross into Atlanta’s waiting defense. While there is a definite chasm in terms of on field quality between the two clubs, at least both teams showed up to match the intensity of their fan rivalry and both teams went for the win. Once Orlando figures things out soccer wise, this will become the marquee matchup that this league will promote to no end… if it hasn’t already begun. I don’t have a full pulse on how people feel about LAFC, maybe because their fan base is milder in terms of arrogance compared to the rest of the teams mentioned here, but they seem good enough and neutral enough, for any team to claim as a new rival for them. I was a little disappointed the league didn’t run with NYCFC vs NYRB for the final course on Mother’s Day footie action, but when the chef realizes that he didn’t deliver on the appetizer and just met expectations for the main course, he knows he has to dazzle and wow his patrons with the dessert. LAFC and NYCFC did not disappoint. LAFC v NYCFC delivered one of the higher combined xGs (3.32) for the weekend. It actually surprised me that it wasn’t a bit higher given the non stop, end to end action that we were treated to. But both sides started a bit tentatively as they tried to settle into a rhythm, any fears of this being a tight affair would all be forgotten as the final 15 minutes was filled with chance after chance after chance. I didn’t really know what to expect from this encounter as it felt like either team could’ve easily dominated the other and nobody would’ve been terribly surprised by it. What we got though, was a fun, back and forth shoot out between two very well coached teams that either team could’ve walked away as the deserved victor. I’m generally not a port guy, but on the occasion I’m surprised when the chef manages to pull off an excellent dessert and port pairing. I wasn’t expecting to be thrilled like this by this matchup, but found myself pleasantly surprised and wondering if this is the start of a new classic rivalry between two aesthetically pleasing clubs.